The phrases “do not fear” and “do not be afraid” appear dozens of times in the Bible. And here’s what the church misses with fear. Let me pose this as a question. What is the opposite of fear? Courage? Bravery? William Wallace? Yet, Christians are the most fearful people on earth. Even our salvation is rooted in fear. Does it bother anyone that the primary method of bringing people to Jesus is to scare them away from hell? Several weeks ago, I decided to remove the words “fear, scared, and terrified” from my vocabulary. Maybe you should do the same. It could change how you see the world. And God. Gluttony is primarily about the heart. It’s a craving for excess. Gluttony says, “Those voids God is supposed to fill…don’t worry about that. I will fill them.” Gluttony happens when you lose your awe of God. You see, as long as your eyes are fixed on Jesus, your heart’s desire is for him. Worrying gives you something to do, but it doesn’t get you anywhere. The great philosopher Van Wilder once said, “Worrying is like a rocking chair. It gives you something to do, but it doesn’t get you anywhere.” That’s right. But Van Wilder isn’t the only one who talked about worry. Jesus said you shouldn’t worry about anything (Matt. 6:25-34). But Jesus wasn’t serious was he? I mean, really Jesus? Anything? If your identity is tied to man’s praise, you’ll be eternally discontent. Yet, we love human praise, at least I do. Exhibit A: Instagram, SnapChat, and Facebook. While I love social media, they’re also platforms that perpetuate flattery. You post pictures about your life hoping the world will “like” it. Who cares if it’s not the real you? You need the approval. So, even if you need 30 minutes to find that perfect selfie, it’s worth the time. It’s hard to point people to Jesus if you need their approval. The church can’t be missional and comfortable at the same time. Here’s what Jesus is saying. You should live with such high integrity that your word doesn’t need attachments to make it legitimate. So, typical phrases like, “I promise,” “I swear,” and “I put it on my mom’s grave” should never come from your mouth. 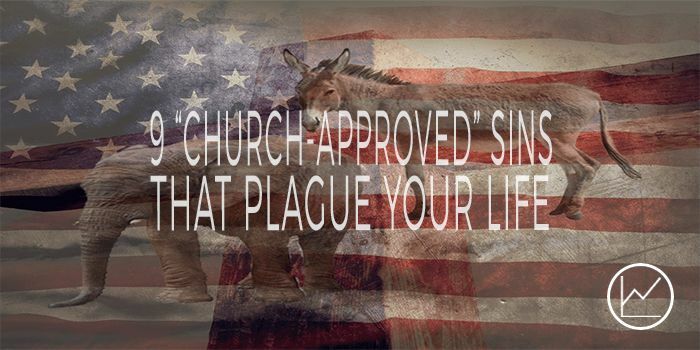 What “church approved” sins did I not mention? Leave a comment below.